We are having a late summer suddenly, it was over 82° yesterday. Perfect time for a cold ice box treat, no? Cara’s recipe called for 2 4″ spring-form pans. I am to the point if I bring in anymore unitaskers, Kirk is going to steam and start tossing my implements out the window. But more so, finding the pans locally wasn’t going to happen. And did I need to drop $14 or so on Amazon and then wait 2 days? Umm, no. I wanted pie. Like now. 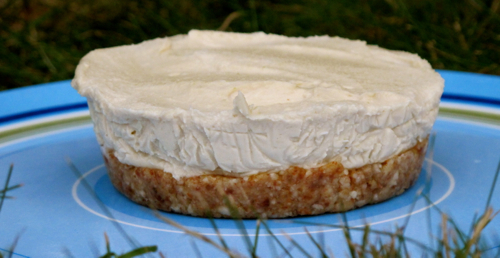 Anyhow, back to the luscious dessert/breakfast/anytime meal…..I would call it more a key lime cheesecake. Creamy and smooth, it would fool most into thinking it was dairy. But at the same time it isn’t heavy like dairy cheesecake is. And while I used 3 mini pans, I’d think an 8″ cake pan would also work fine. As long as you line the pan and make sure it is very cold, removal is easy. Cover the cashews with cool filtered water, let soak for about 3 hours, drain. with plastic wrap set aside. Add the curst ingredients to a food processor, process until finely ground. Divide equally between the pans, press down with fingers or a flat measuring cup till evenly flat. Set in the refrigerator while you prepare the filling. Add the drained cashews, honey, lime juice and zest and vanilla to a high-speed blender, process on high, tamping as needed till smooth. Add coconut oil, process until mixed and smooth. Immediately spoon into the prepared pans, smoothing down. It is OK to mound up the filling on top, it will firm up. Do NOT leave any leftovers in your blender, fill with hot water and soak right away. Don’t ask how I know this…..sigh. Good thing I have bottle brushes loitering around…. Refrigerate till set, give it at least a couple of hours, overnight is best – the flavors develop, the lime becomes more mellow, less acidic. Turn gently over on a plate, peel the plastic wrap off and invert on a serving plate. Makes 3 pies. Serves 3 to 6. A girls gotta do what a girls gotta do…. :)! Those look super yummy! Love baking with cashews! Delicious! Oh yum! I love key lime pie! Looks fantastic, and just the thing to say farewell to summer.